During HP Discover last month, I had a great chance to hear from David Scott, Senior Vice President and General Manager of HP Storage, and also to have a conversation with Siamak Nazari, the Chief Software Architect of 3PAR. One of HP’s talking points for 3PAR for the last several years has been around the idea of Polymorphic Simplicity – a marketing term that they use to describe how HP is positioning the 3PAR architecture from the mid-range, to performance to high-end storage all with a single architecture, feature set and interoperability. With the current arrangement of 3PAR systems, HP has the mid-range StoreServ 7200 with 2 nodes max, the StoreServ 7400 with 4 nodes max, it has the all-flash performance focused StoreServ 7450 and then the high-end StoreServ 10000 series arrays with a max of 8 nodes. All of the systems share the same 3PAR ASIC and software. The management interfaces and configuration concepts are the same regardless of which model. The underlying OS is the same across all – meaning that although the 7000 series was introduced just 1 year ago, its runs the same OS as the flagship 10000 series arrays which have been proven. The illustration below is from HP to show how the 3PAR architecture fits many different use cases where different factors are most important – all with one common architecture underneath. While I’ve heard the message at previous HP events, it wasn’t until talking with Siamak Nazari that I began to understand why this has been such a big point from HP. Evolving a storage OS is a difficult tasks for any company. That’s why storage innovation often happens with start-up companies that build a new design from the ground up, instead of inside of mainline vendors evolving their dual-controller arrays into a modern storage array. HP’s purchase of 3PAR brought them a modern storage architecture that was natively multi-node capable. Where the complexities are exponentially more difficult to move from single controller, to dual controller to multi-controller, HP took the opposite approach by adapting a modern 8-node architecture down to a 2-node and 4-node configuration. The real key for HP 3PAR customers is that by HP building a portfolio that spans a wide breadth of use cases, it expands the install base of the overall architecture while refining and enhancing the underlying OS. Enhancements made for one particular use case get shared by all of the customers through shared enhancements. Customers ultimately win by getting incremental improvements from their existing investment – all delivered by software. 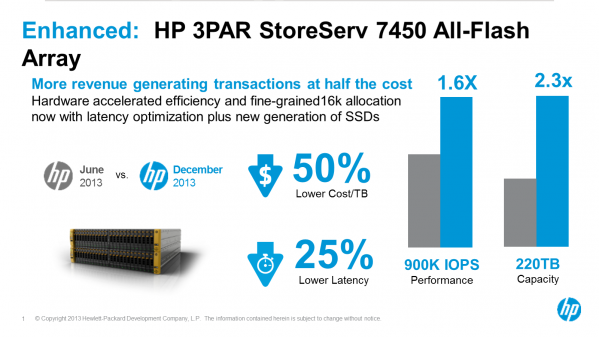 HP has been consistently shipping improvements through software on the 3PAR StoreServ systems for several years. When it introduced the HP 3PAR StoreServ 7450 in June of 2013, the all-flash array boasted OS improvements for handling all-flash drives in the array. In December, HP revised the 7450 and nearly doubled performance to 900,000 IOPS with less than .7 milliseconds of latency [100 percent Random Reads, 4K block size local to controller] and more than doubled the possible capacity by introducing a new technology called Adaptive Sparing and by introducing new 480GB and 920GB SSDs at lower price points. Adaptive Sparing allows the HP’s 3PAR StoreServ array take over coordination of sparing flash sectors instead of having the individual drive handle sparing. HP found that it could manage the sparing capacity as a pool more efficiently than by letting the individual drives handle this — and that allowed the 3PAR StoreServ arrays to access more of the actual flash capacity. The net result is an increase in overall utilization and lower the price point for flash in the array. So, where is the benefit here for all? While the Adaptive Sparing technology was developed specifically for the all-flash 3PAR StoreServ 7450, the same Adaptive Sparing technology is also benefiting any HP 3PAR customer who is using SSD. This was one of the best examples of benefits from a common architecture that I had heard from HP. But common architectures is not just a benefit from the HP 3PAR StoreServ – it is an approach adopted by other HP Storage solutions, also. HP’s StoreOnce D2D backup, StoreVirtual arrays and StoreAll NAS hardware are all based on their ProLiant hardware configurations. Since HP has made the conscious decision to build out solutions based on ProLiant servers, each generation provides performance increase and innovation that is also shared with software solutions. During Discover in Barcelona, Spain, last month, HP announced the new generation of the StoreOnce – the StoreOnce B6500 – based on the ProLiant Gen8 server hardware which boasts considerable performance gains obtained both by software and hardware improvements. Taking the common architecture further to the software stack, StoreOnce and StoreAll also have a lot of shared DNA within their software stacks. Both solutions leverage the IBRIX technology that HP acquired in 2009. According to David Scott, the IBRIX distributed file engine is used across a couple product lines, although not specifically talked about. While HP knew that the IBRIX technology was fantastic technology, it was really about targeting the correct solutions for a problem and tuning the software to specific solutions. And like the shared ProLiant and shared 3PAR technology, incremental improvements on one side will mutually benefit the other sides as well. Microsoft leaks Windows 7 to BitTorrent dilberately?